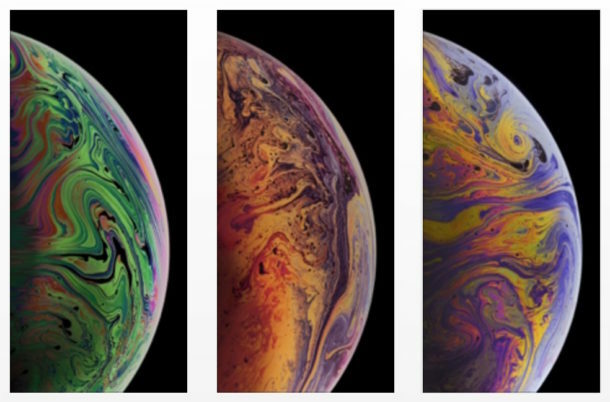 The new iPhone XS and iPhone XS Max include some fanciful wallpapers of colorful bubbles, they look sort of like bubbles of oil paints or even some fictional gas planets, but you don’t need to pre-order one of those fancy new iPhones to get your hands on the snazzy wallpaper images. If you want to spruce up your existing iPhone or iPad with the latest wallpaper collection from Apple, you should enjoy these 3 wallpaper images of the color bubbles from the iPhone XS and iPhone XS Max. While the official versions on the iPhone XS line are Live Photos, you can download the regular stationary versions below for enjoying on any device. Interestingly enough, these wallpapers are not included in the iOS 12 GM release, though it remains to be seen if they’ll be included in the final version that is due on 9/17. In the meantime, you can prepare for the iOS 12 update and download the wallpapers below to enjoy now. Click on any of the thumbnail images to open the full size wallpaper in a new window, then you can save it to your device and set it as the wallpaper in iOS, on a Mac , or whatever other device or computer you want to try them on. If you want to get them all at once rather than one-by-one, you can download the iPhone XS wallpapers from iCloud here, both of those collections were posted to iCloud.com by 9to5mac. These images are hosted by 9to5mac on their servers, so cheers to them for digging up the images and then hosting the wallpaper images in full resolution on their site. You can also download the 12 iPhone XR wallpapers of color bubbles too, they look a bit different but are also nice to look at. They look like oil, oil paints, argon, mammograms, gaseous planets, renderings, marbles, paint balls, and anything else spherical and colorful.